It has been a very challenging yet a productive year for The Tennis Foodie. As I mentioned before, The Tennis Foodie was born out of love and passion for Food, Tennis, Fashion and Travel. My second year was not short of drama, features, awards, travel, tennis and fashion. The Tennis Foodie is expanding his network by promoting his articles on social media. Last year I mentioned that I’ll build on my Pinterest account but I was too busy. I focused more on Facebook and Instagram. This year, I was able to travel to 2 countries (Brunei and Australia). The Tennis Foodie did 15 countries last year. It was a hard record to beat. Maybe post year 2020? In the tennis department, I only played 3 tournaments (2 singles and 1 doubles) and withdrew in the last 3 events I was supposed to play. It was another injury-marred season. Currently, I’m taking my time to recover and do a much smarter schedule next year. I was about to hang my rackets but I would like to give it a one more season. I just want to win a tennis trophy. It’s a personal goal of mine. I got as far as quarterfinals (singles) and semifinals (doubles) for the last couple of years. I just want to have one breakthrough tournament! I hope 2019 is finally that year! During one of my tennis matches sporing my Vollaix tennis kit and TenxPro racket. As I said before, 2017 is my travel year! 2018 is definitely my blogging breakthrough year! At the first half of the year, I wasn’t doing well. 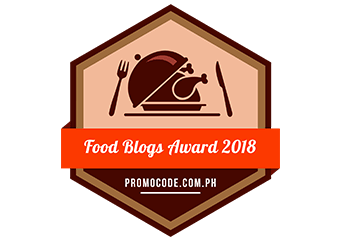 After I won the Food Blogs Award 2018 this year, everything changed. My confidence grew and I did not look back. I fell in the middle of the year as low as 1M+ in rankings but I was able to pull it back. I achieved my career high ranking of World # 296,420 and got numerous features and awards. With regards to sponsors, The Tennis Foodie welcomes Allmytea to the list. Being one of the best refreshing drinks in the country, Allmytea will be the official drink of The Tennis Foodie. Refreshing Iced Tea anyone? There will be MORE giveaways, raffle, contests and other fun activities in store for my readers in 2019. Thank you to all my loyal readers and followers who have been there on my ups and especially on my down moments. This blog is dedicated to each and one of you. Let’s make 2019 a better year. I’m eager to hear your feedback and suggestions on my comment box. Thank you for being part of my gastronomic journey. Thanks for sharing your thoughts,ideas,experience with us.Ive learned so many things through your blog.Keep it up.Happy New Year. GODBLESS!!!! congrats on all the achievements this year – crossing my fingers you get your championship in 2019! Thanks for sharing your stats. Sounds like a pretty awesome year, and I wish you nothing but even more stellar success in 2019. You have great stats! I am a new blogger, so all of your travel and experience is great to read about. Hope you enjoy continued success in 2019! I’ll take an iced tea. Thanks! 🙂 It’s awesome to reflect and to do so in a constructive way. Kudos and happy new year. This year has definitely been a whirlwind. You should be proud of these things that you have accomplished for sure! 2018 was a great year for you. Great job on getting those social media numbers up. Here’s to an even better 2019! I just want to congratulate you on the wonderful year you’ve had. I truly hope 2019 meets and exceeds what you were able to accomplish in 2018! Looks like your growing at an impressive pace! I hope 2019 brings even more great content and growth for you. Keep it up! Wow, you have surely traveled more than I. I have never been out of America! I wish you the best in 2019. Way to go on your achievements! I hope that you get that trophy this year, and it seems you’re going about it the smart way, and resting when needed! Your 2018 was a good year! Getting your social media numbers up this year is a wonderful goal. I wish you all the best in 2019 and beyond! Seems like 2018 was great for you: especially in terms of social media growth! I am sure you will have an amazing year ahead. Cheers! Congrats on making through another year of blogging and the awards. Blogging is a long and hard journey, but it is all worth it in the end. Look forward tor reading more of your posts this year! It sounds like you’ve had a great year! It looks like your social media followers have increased quite a bit. That is great and very encouraging for me (I’m a new blogger!). I hope you have a wonderful year in 2019! Thanks for sharing your year, and your stats and achievements. Well done! Truly awesome achievement! It sure pays to be patient and work towards the goal you have set in your mind. I wish you more success and keep writing and sharing! You seem to have had a pretty rocking 2018. I am sure you shall scale many more summits of success in 2019. Really appreciate how you balance tennis as well as travel. Wow! You seem to have some really mind boggling numbers there. Looks like a great way to end 2018 and start 2019. Brunei is one place I am really looking forward to visit. I am glad you could get there last year. I could pick some tips from you. Great progress, congratulations! I hope the year 2019 will be even better. It is pretty cool that you have been able to combine two hobbies in to a one, and even create a blog form it. Happy new year and great games! It sounds like you put in a lot of hard work over the years and it shows with your improved rankings! Congratulations on the awesome growth on your website rankings as well as your social media outlets. It really shows that by dedication you can make things happen! You are doing great, and congrats to your achievements and more travel! Keep doing what you love to do and share us many amazing travel stories. I am looking forward that you share us your top tennis destinations, where are the best tennis courts, etc.